Mobiles have revolutionarised Healthcare, a big way, They are further going to make a mark in developing countries like India because of its reasonable penetration, Good subscriber base and ease to use. The availability of low-cost mobile phones and the already broad coverage of GSM networks in India is a huge opportunity to provide services that would trigger development and improve people’s lives. Today's Newspaper (Times of India) says- "3G Handsets to cost less thanRs. 5000 In a year"..Read more on Page 17 tuesday, September 15, 2009. Yesterday, When a friend asked me - How secure will be the consultations provided by doctors over mobiles? ?, Say if somebody changes or tampers the prescription before it reaches the target consumer?, If there is some error in despatch , some inaccuracy etc., So till the time HIPAA compliance or HL7 server capacity is leveraged, Mobiles based Healthcare delivery will continue be a falcy. The Good News , Dr Neelesh shared with me on Health on Mobiles that there will be HIPAA compliant Doctor Diagnosis/consultations available now. The mVisum Medical Communication System is a communication tool that allows medical professionals to securely receive, review and respond to patient data recorded at the point of care.Information is transmitted via secure HIPAA compliant internet servers then transmitted through mobile technology to the required physicians’handheld smartphone. 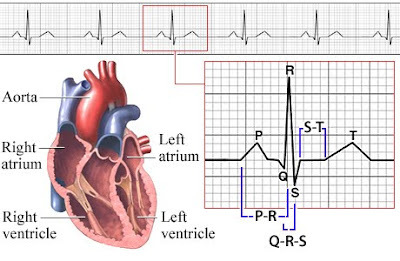 Lets take an example , Have you heard of EKG, something like the picture below.We know this by ECG. A very common diagnostic procedure. Using this service from mVisum, Of 600 EKGs read on a Blackberry mobile device, 599 were correct diagnoses.Great Accuracy. But is that 1% difficult to digest?? Lets move to privacy now, In order to take advantage of the technology, they use a GE Muse server and digital EKG. The mVisum software knows when an EKG is taken and grabs a copy (as does its internal EHR). If a call is placed regarding a patient, the cardiologist can scroll through the EKGs, locating the patient of interest and view the image off-site. Everything is server-based, so the EKG does not reside on the phone-when the physician logs out, there is no accessible data left on the phone. This is Great! I was also impressed by 3Gdoctor.com's new concept. The Concept looks very interesting, But It costs a bomb, so not for rural market or to support connectivity in far flung areas. 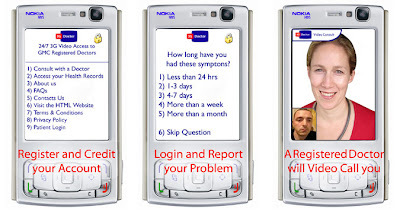 Folks in the UK have a new way to access medical assistance, i.e. via a 3G cell phone...it does not replace having a regular primary care MD, but it does cost...35 pounds per consultation...and accepts credit cards, pay pal, etc. It also offers the opportunity to create a personal health record here...no prescriptions given here. Once you have completed your Medical Questionnaire your answers will be sent for review by a registered Medical Doctor who is insured to practice by the Medical Defence Union or Medical Protection Society. Video conferences should be started within 1 hour of the request and are 24/7...365 days a year...and if you miss you call after 2- attempts, you will have a cancellation fee of 15 pounds. To Read more click here. Successful examples like Aarogyasri and DrSMS in India suggest utilising mhealth for social causes, Health awareness and prevention. 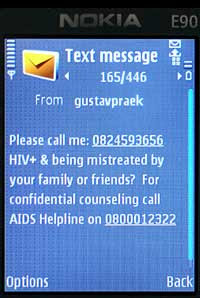 Some better examples for developing nations like India come from Frogdesign and Frontline SMS. 1. How Should the Evolution of Mobile Healthcare Take Form? Simple or Advanced Services Development? 2. Where does mobile play a role - Limitations and Advantages, Extent of digitalisation, and support infrastructure required ? 3. Consumer Needs, Information Gaps and Role of the Ecosystem Player in the Healthcare Value Chain? 4. Challenges and things to watch out? 5. Exploration of Services and Evaluation of New Business Models? @ Dr Ruchi Dass. Awesome Inc. theme. Powered by Blogger.